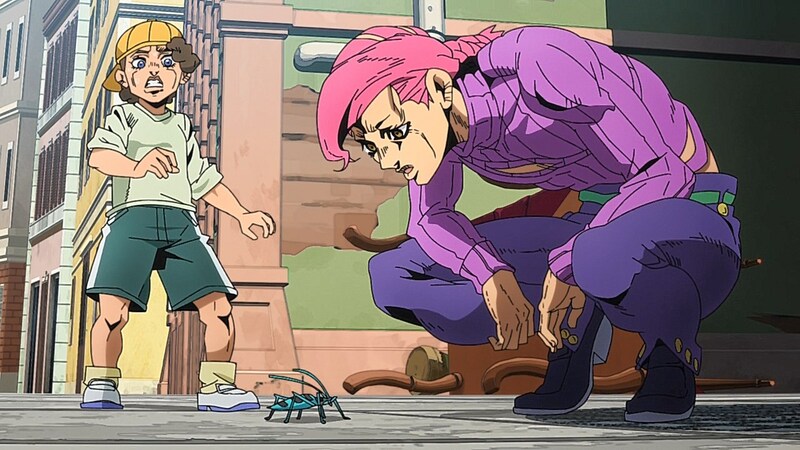 So we’ve come to one of the many hotly-anticipated moments of Part V with the introduction of Vinegar Doppio, an agent for the Boss who is not so secretly the Boss. 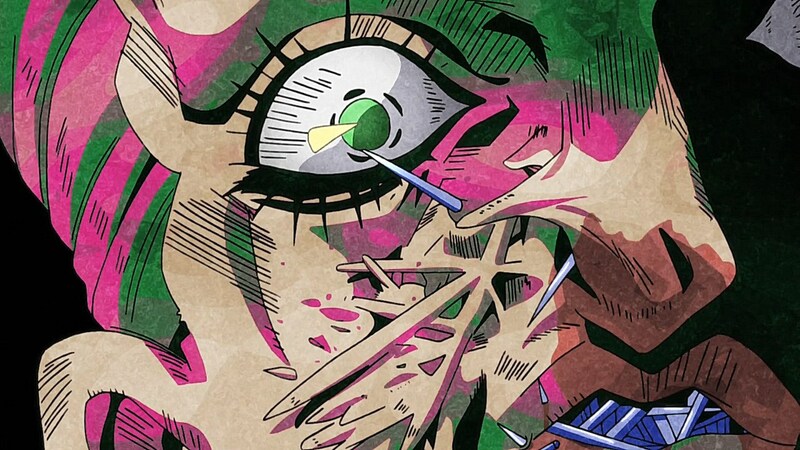 In the process of navigating Sardinia to protect the Boss’ identity, he stumbles into random acts of violence, impromptu phone calls, and body horror that have been memorable enough to linger within the minds of manga readers for years. 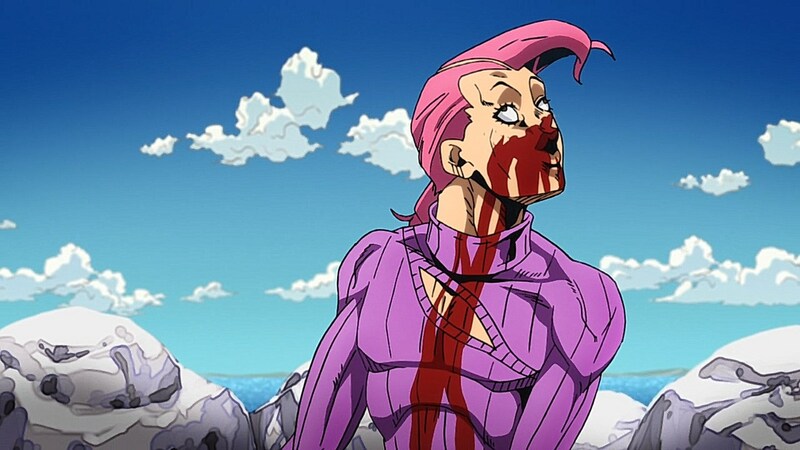 But with the anime reaching this point, would they be able to capture Doppio’s fight with Metallica without making the entire screen black? 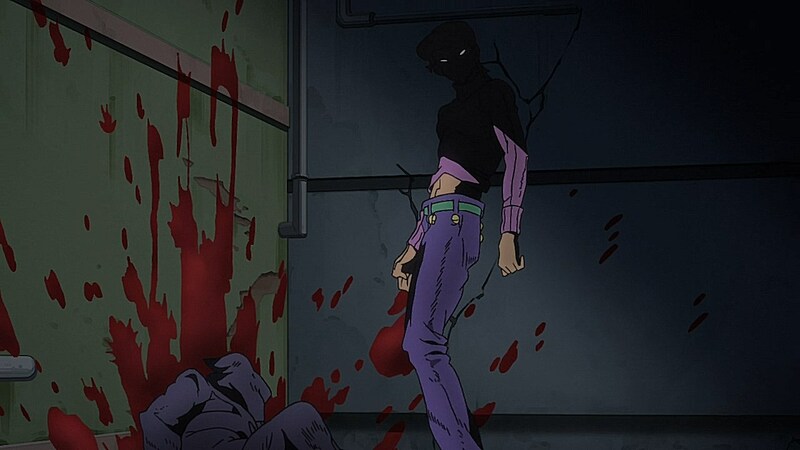 This episode answers that question and then some. 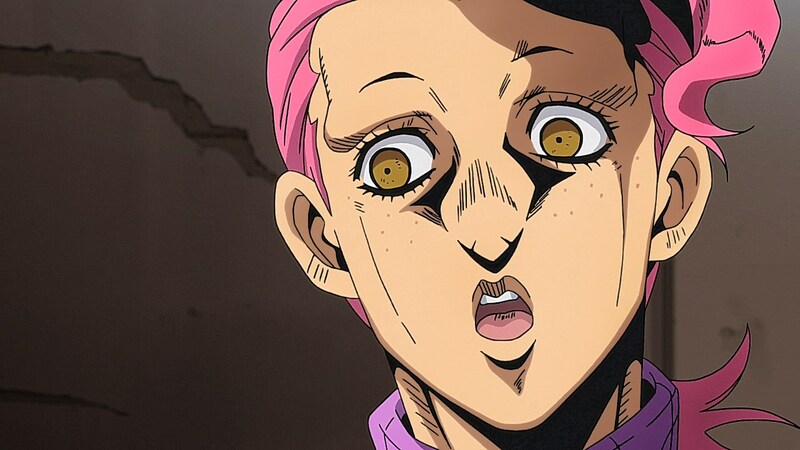 Let’s begin by exploring the character of Doppio. 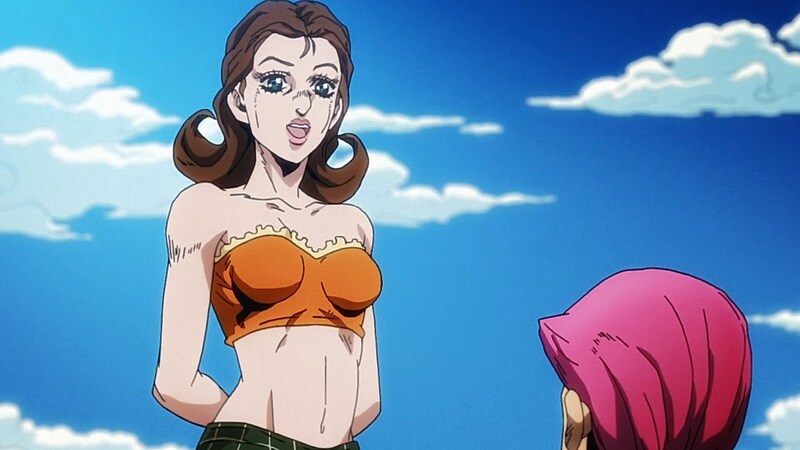 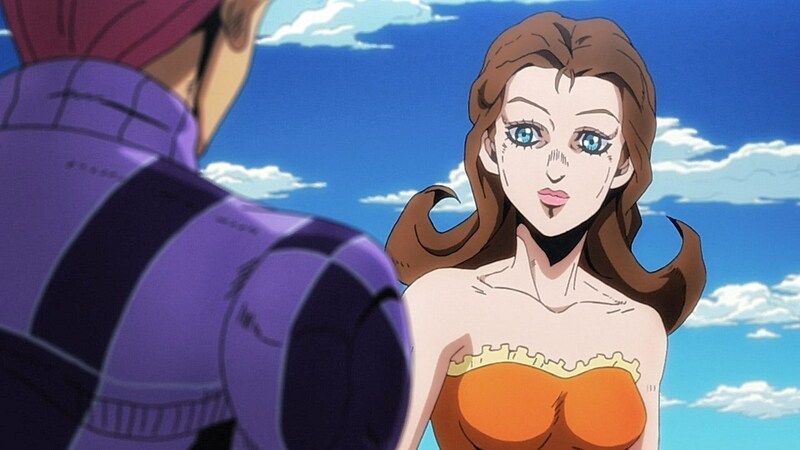 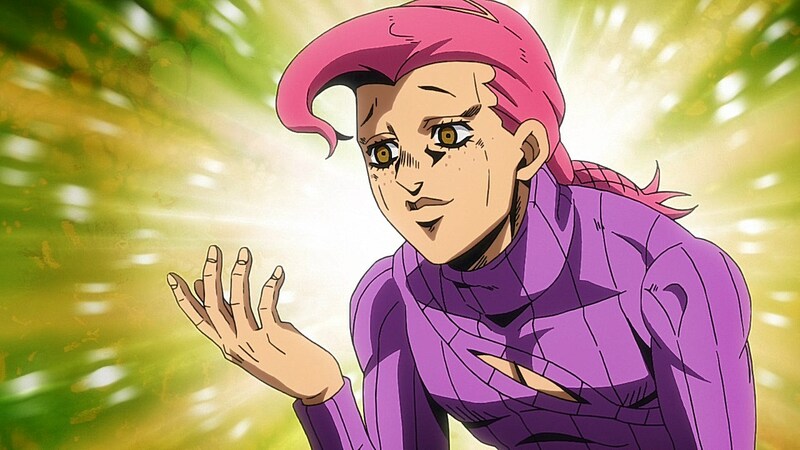 Resembling the Boss’ younger self before the mafia life, Doppio finds himself doing the Boss’ bidding as a personal agent sent out to Sardinia in order to take out Passione before they unveil his identity. 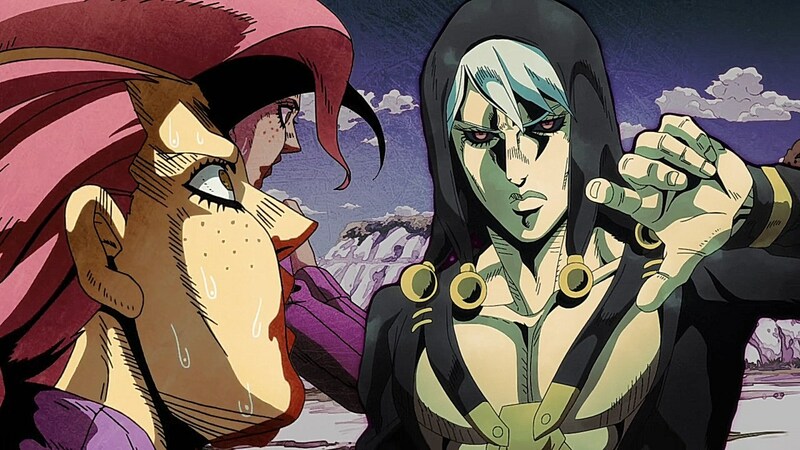 The only problem is that Doppio is interlinked with the Boss to the point of sharing just about everything with him. 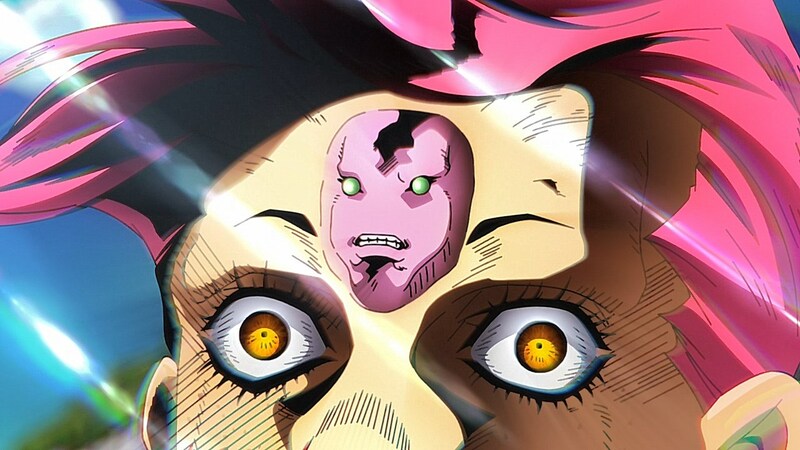 Whether it be his deep paranoia for being exposed, the fortune teller being able to predict his true identity, or the fact that he was “given” King Crimson to “borrow”, they don’t keep it much of a secret that Doppio is an identity the Boss manufactured to help him interact with the general public without anyone knowing who he could possibly be. 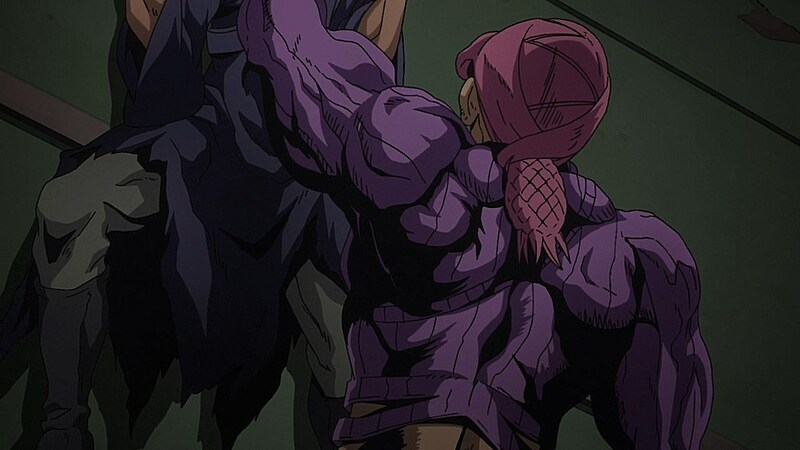 Because of this, Doppio has little concern for people who bother or bully him until they show interest in something that could reveal his identity to them. 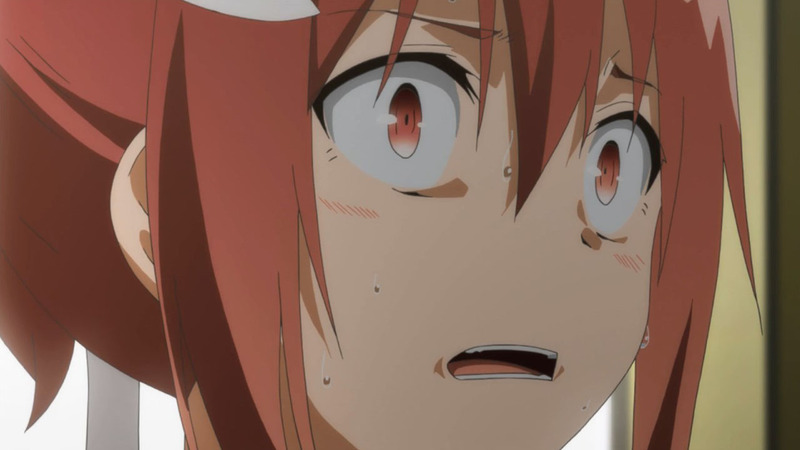 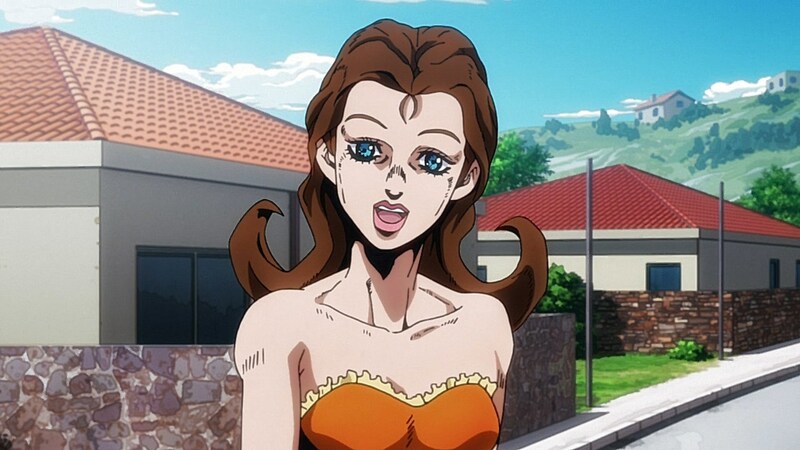 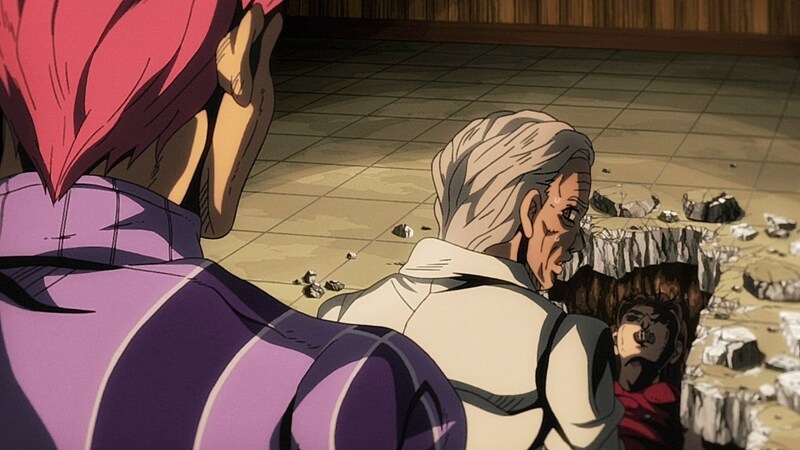 The narrative is effective in showing just how many layers there are to the Boss’ identity by having his flashback shown as a jumbled mess, going so far as to even making his father a secret and being mum about how he went from burning down his city to being a mafia boss in his early 30′s. 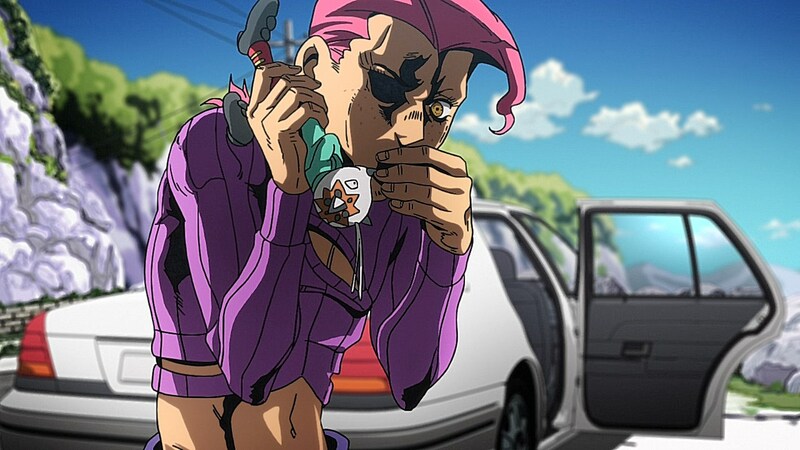 At the same time, Doppio’s lack of awareness towards his presence as the Boss give him the opportunity to act parts of his personality that remain dormant in his regular form such as his eccentricities and his tendency of pretending that any inanimate object close to him is a ringing cell phone with a call from the Boss personally waiting for him. 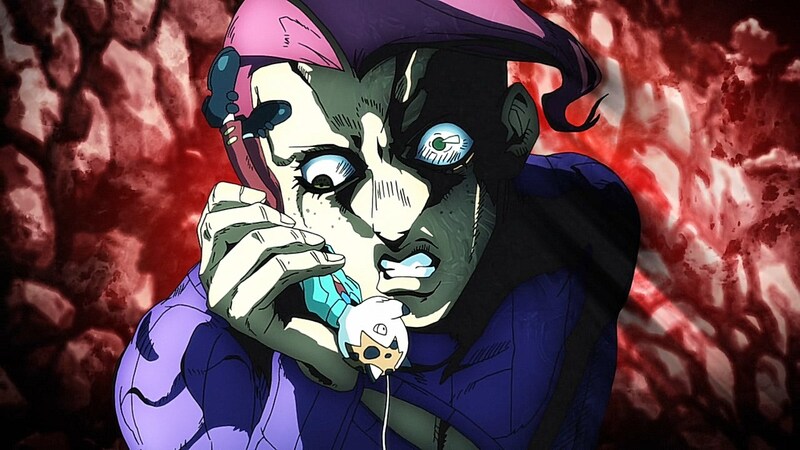 While Doppio’s phone antics have been integral towards the amusing quirkiness that comes with the character (or the Boss’ convulsing as he calls Doppio cute), it is his fight with Risotto that continues to linger in the minds of fans to this day. 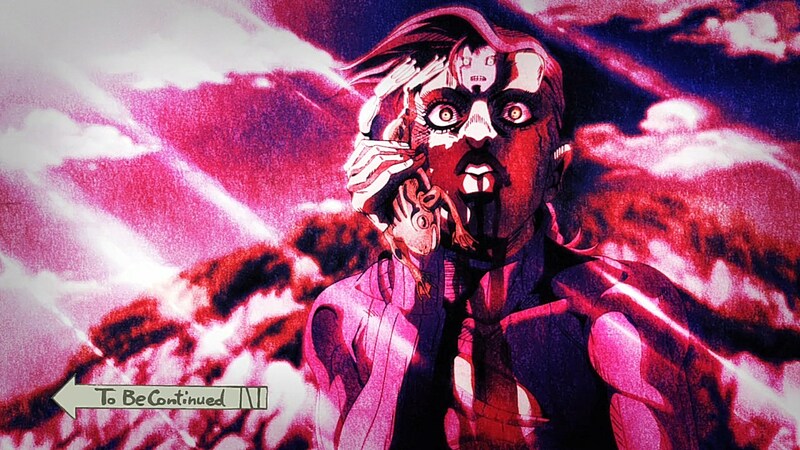 This is because of the brutal and twisted ability that Metallica has to manipulate the iron within Doppio’s blood. 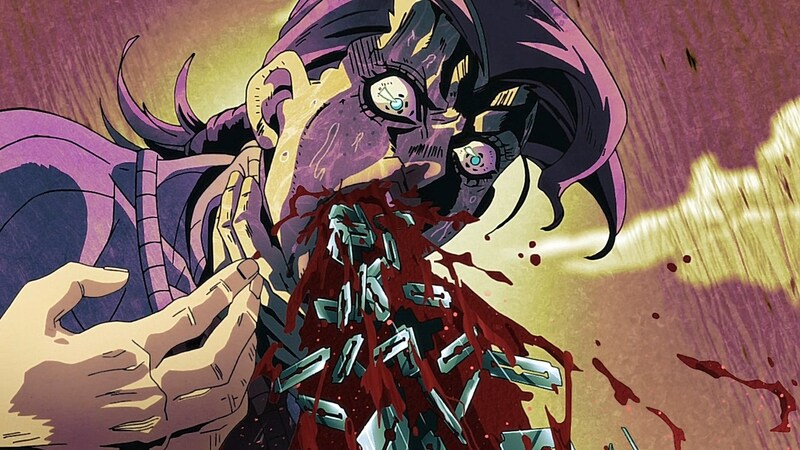 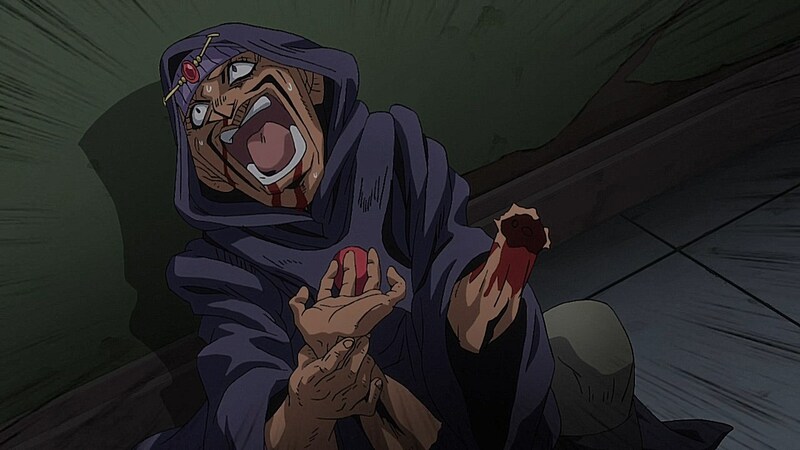 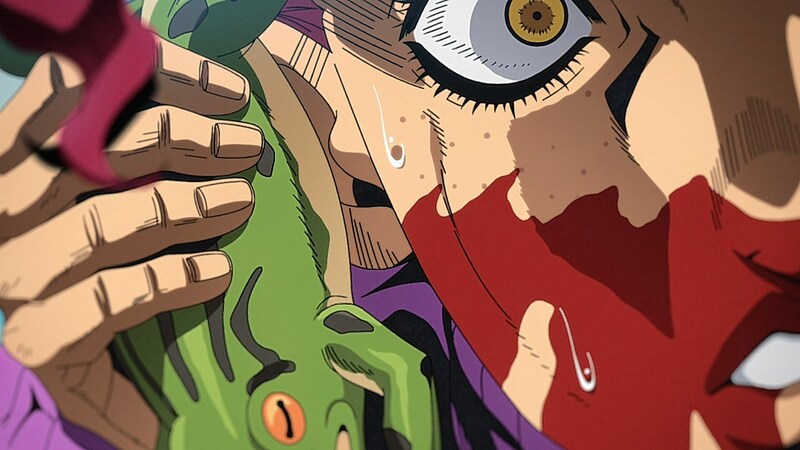 The effects of Metallica bring out two cringe-inducing instances of body horror as Doppio starts projectile vomiting razor blades and needles, shredding apart his mouth and several of his internal organs. 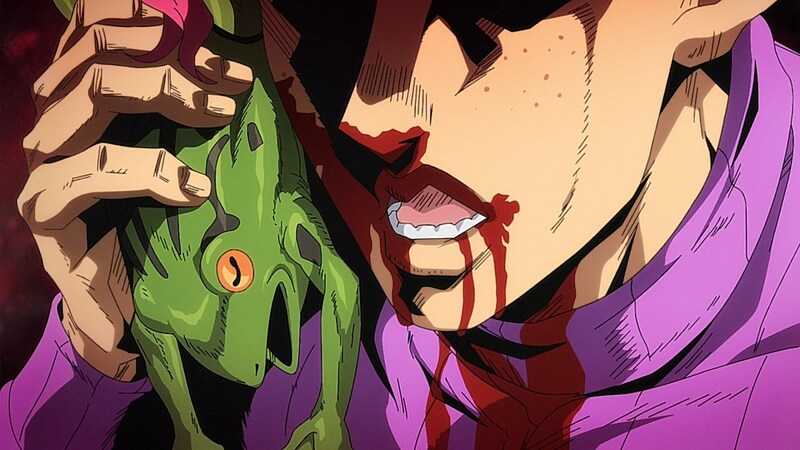 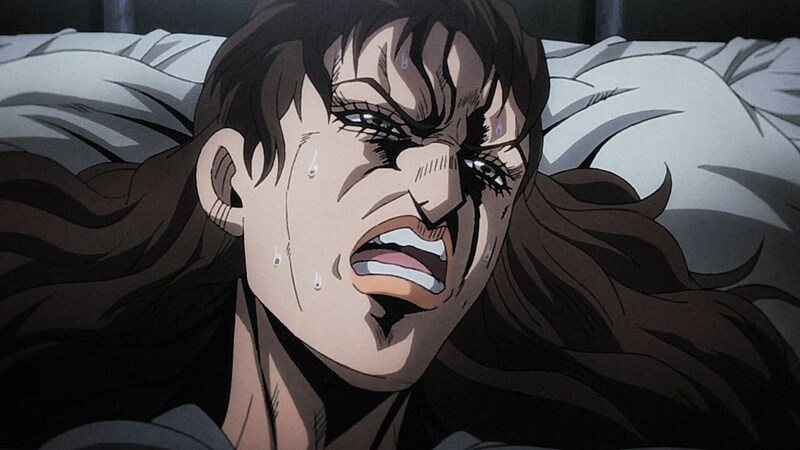 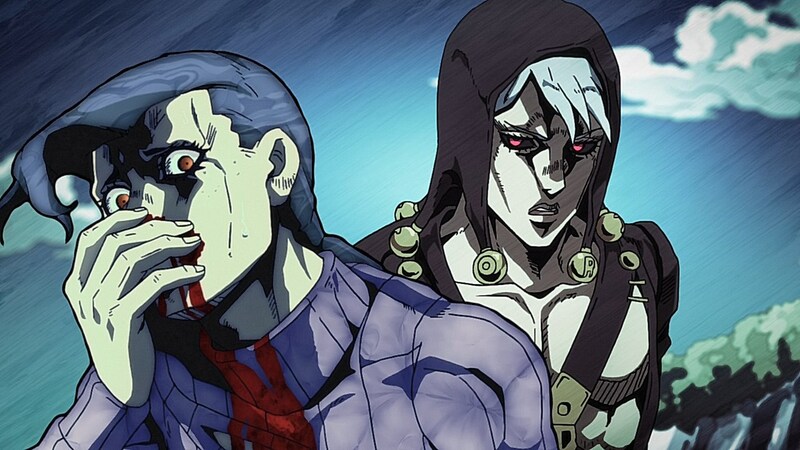 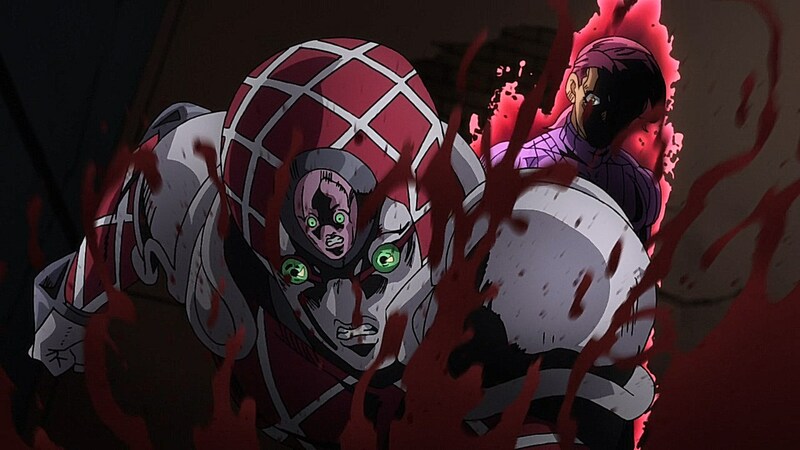 I always thought the stands that melt or rot people were the grossest, but the horror from Metallica’s stand is from the sheer pain that one must feel if they were to go through what Doppio did when Risotto activated Metallica. 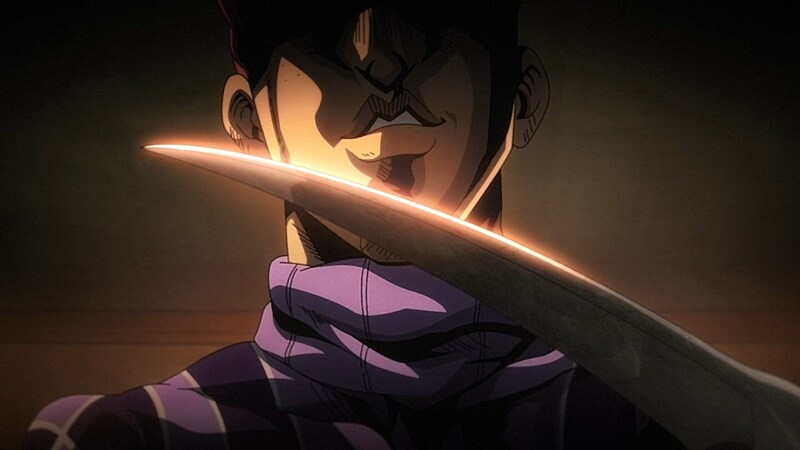 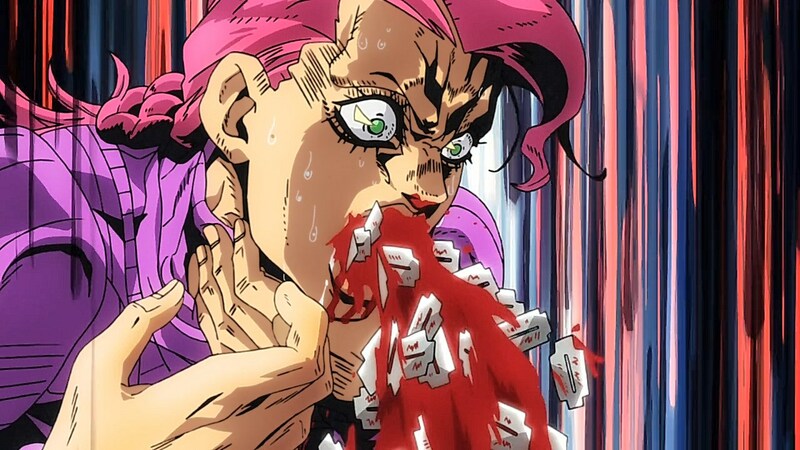 The anime sells it even further by showing just how many razor blades Doppio ended up vomiting as torrents and torrents of razors and blood pour out from Doppio’s mouth. 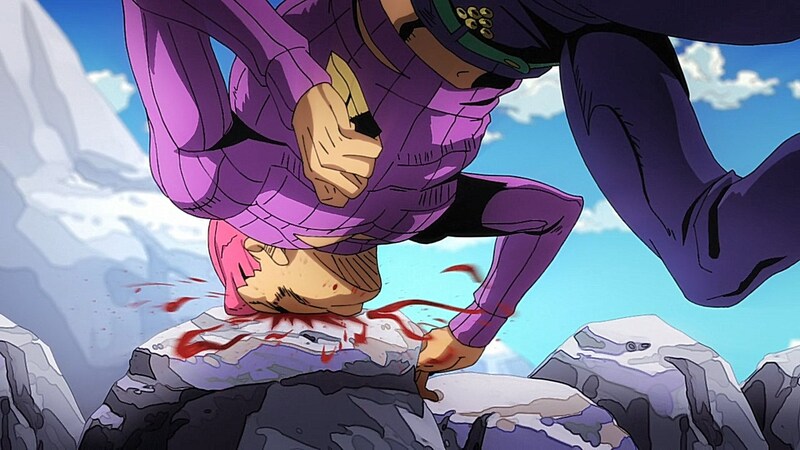 Even worse are the needles that end up forming through Doppio’s mouth and cheeks, causing him to upchuck those as well. 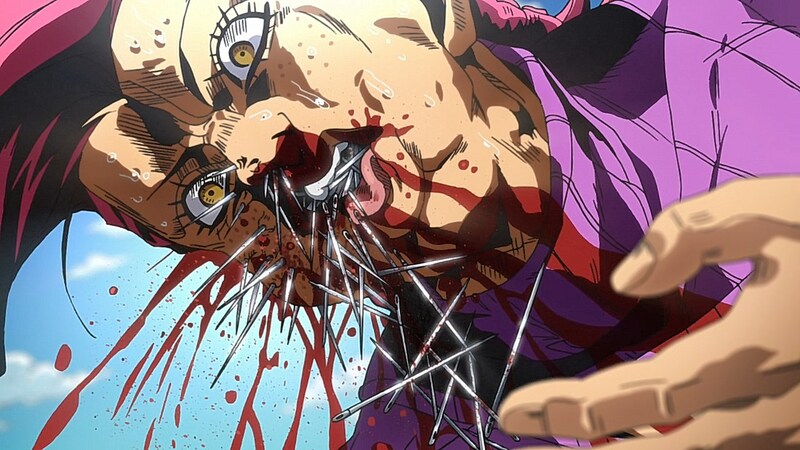 It’s that level of violence that has made Part V a playground for Araki to experiment with stands designed to kill, main, shred and destroy. 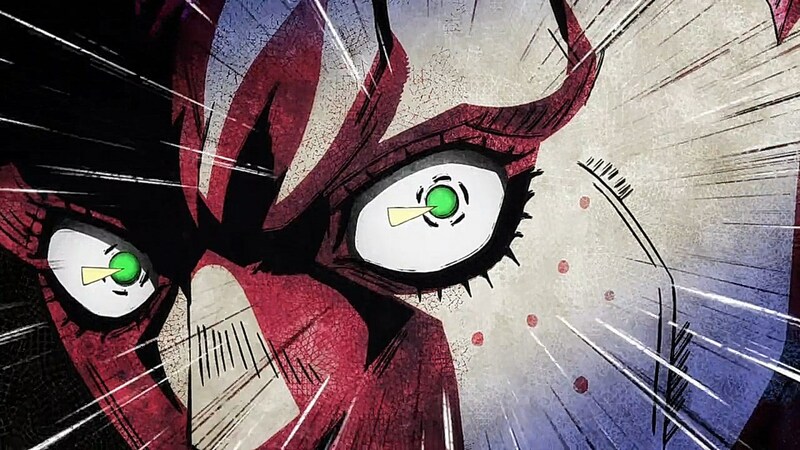 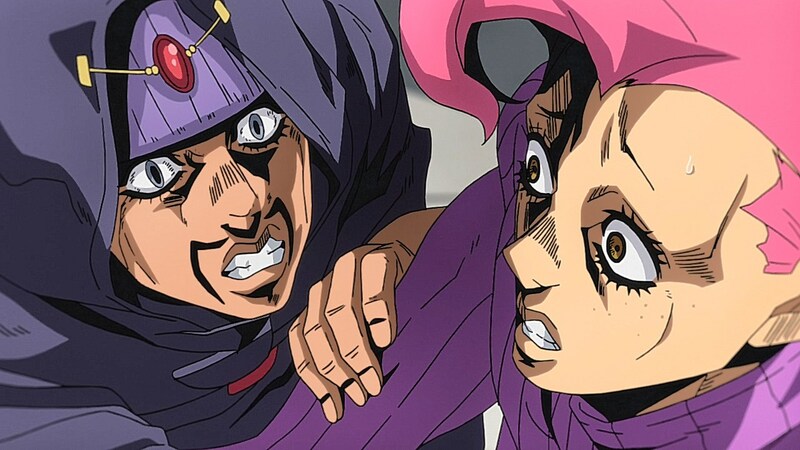 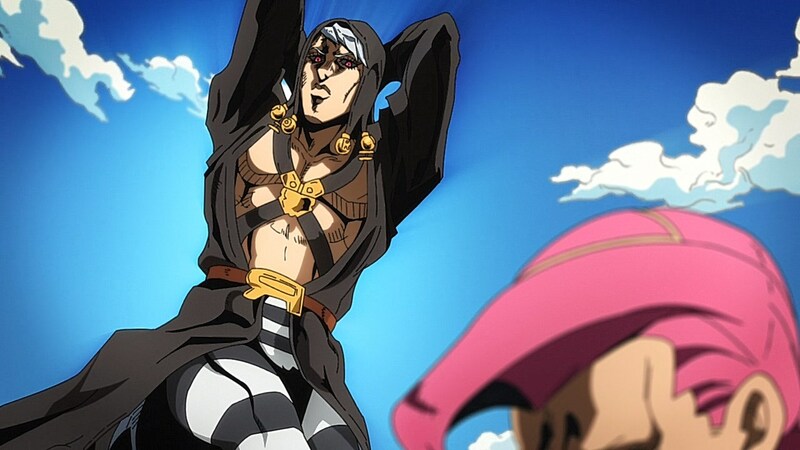 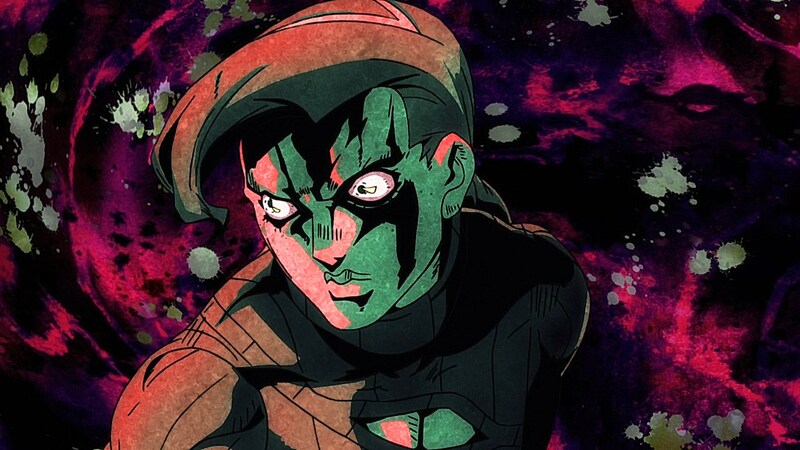 While King Crimson was previously used to help kill the fortune teller, the fight Doppio has with Risotto will show us exactly how he’ll be able to use King Crimson in a practical fight against someone with a lethal ability like Metallica. 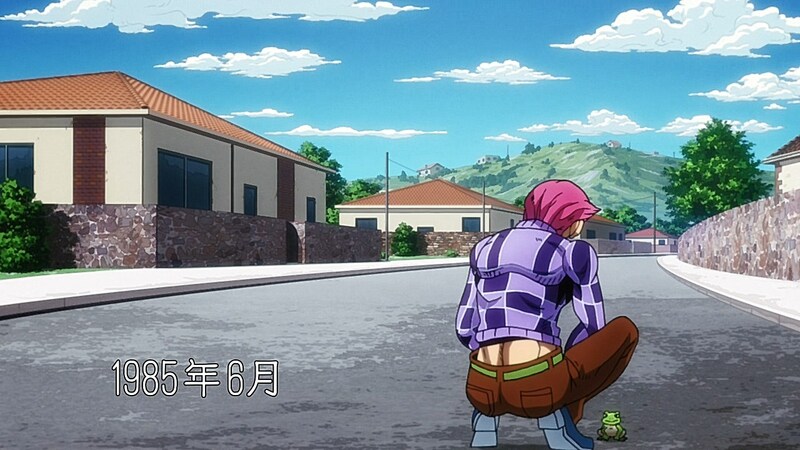 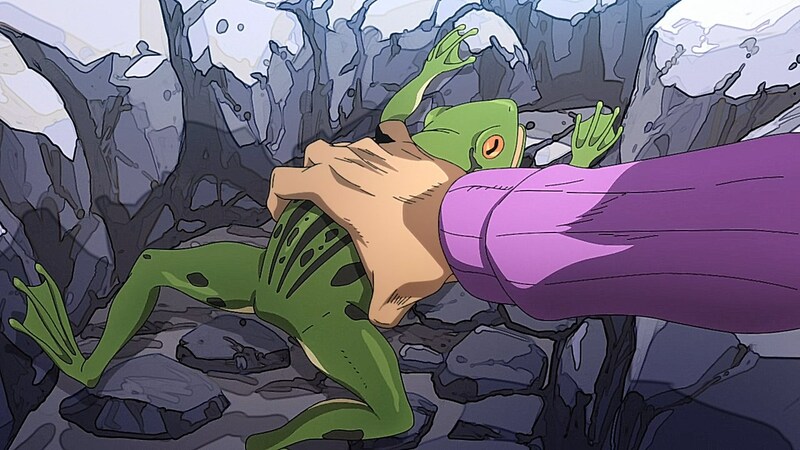 I love Doppio’s introduction and his antics with telephone frog. 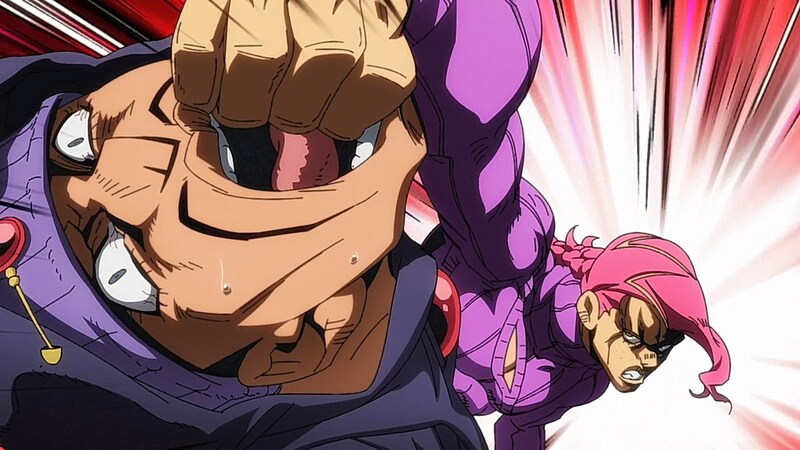 How the “boss” doing that with his body and why the guy just double crazy?